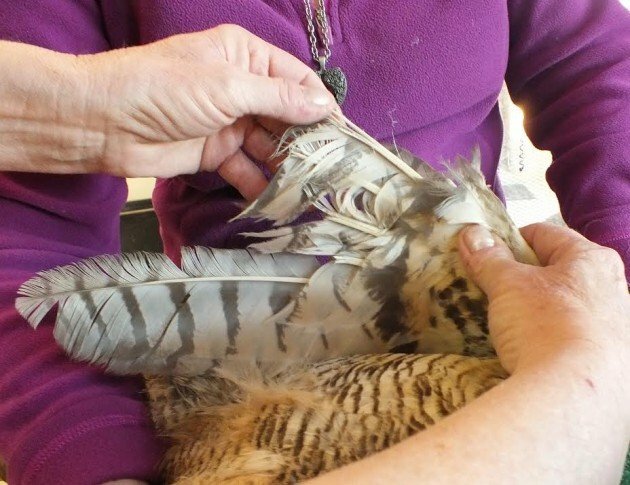 This guest blog was written by Mikal Deese, Wildlife Educator, Rehabilitator, and founder of On A Wing And A Prayer in Corrales, New Mexico. 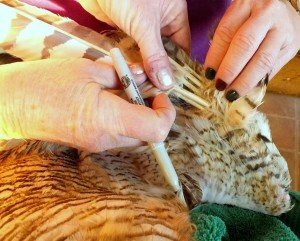 Back in October, ON A WING AND A PRAYER was brought an injured Great Horned Owl who had been found on the median of a rural interstate highway several hundred miles away She was a great big female, presumably hit by a vehicle. 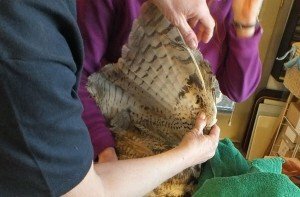 Luckily, she had no broken bones, but she did have a large open wound on her right wing. Over the next months, it healed very well. Unfortunately, in the meantime she broke the first six flight feathers on that right wing. She could fly, but was impaired. Now for the romance part of her story. During her stay she had attracted the attention of a wild male Great Horned. He visited her every night, sitting on top of her enclosure so they could sing owl-ey duets. (Actually they hooted back and forth every 17 seconds, all night long, I mean ALL NIGHT LONG.) He was remarkably persistent, in spite of the fact that she was not free to join him to go nest shopping. By January all the other Great Horns were similarly pairing up, with visions of squeaking, ravenous fluff balls in their futures. It was definitely time to get her out of here! It was time to try an old falconer’s trick called imping. Good feathers can be transplanted onto the quill stumps of broken feathers. These can be either molted feathers, or in this case, donor feathers from another bird who had died from her injuries. Since the feather shafts are hollow, they can be cut to fit and then spliced into place with a connector that fits inside both ends. 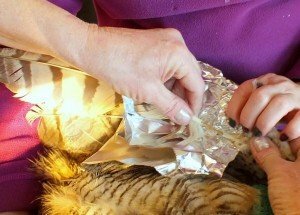 Depending upon the size of the feather, the connector could be a wire, a toothpick, a sliver of plastic, or – in this big girl’s case – two sizes of bamboo skewers. I knew imping was possible, but had never actually tried it. Since I didn’t have an old falconer on hand, I watched some YouTube videos. Being a long time crafty sort, it looked to me like I could do a better job than some of them. With the help of a trusted owl-holding friend (essential!) the transplant process went beautifully. We put her back in the mews to try out her new wing. She flew powerfully and straight. On Valentine’s Day evening, she was once again free. We all wish the happy couple many ravenous fluff balls of their own! All photos by Mikal Deese.